Timphu, Bhutan -- The first major international seminar which drew more than 80 participants from across the globe to discuss the depth and profundity of the concept of Gross National Happiness (GNH) agreed that GNH combines spirituality with secular science of technology and that the global community should protect and enhance it. Senior professors, research fellows, journalists, lawyers, medical professionals, Buddhist monks, managers, environmentalists, economists, social activists, financiers, and academicians made 15-minute oral presentations of about 45 papers during the seminar from February 18 -20 which was attended by more than 300 people, mostly young students, graduates and civil servants. The presentations were cablecast in two separate rooms for people who could not fit in the main hall. “Although the concept of GNH was first pronounced by His Majesty the King in his speeches soon after acceding to the throne in 1972, it was, however, only in the last two decades that the concept was formally incorporated as a guiding principle in development policies and plans,” said the president of the Centre for Bhutan Studies and prime minister Lyonpo Jigmi Y Thinley inaugurating the seminar. 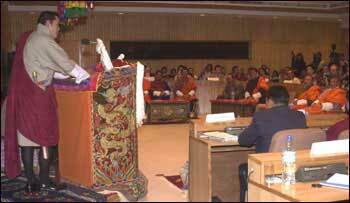 The concept of GNH was first metioned to the international community in the autumn of 1998 at the Asia-Pacific Millennium Summit in Seoul. This was followed by a bilateral seminar “GNH - as challenged by the concept of decent society” held in January 2001 in Zeist, the Netherlands, co-hosted by the CBS. More recently, the SAARC economic and planning ministers adopted the concept of GNH and its four pillars among the principles and strategies for the eradication of poverty in South Asia. Putting GNH in an historical perspective Mark Mancall, a Professor of modern history at Stanford University, USA, referred to the arrival of Zhabdrung and the subsequent establishment of a “diarchic” regime where the political and the religious domains were intensely intricated with each other. This intrication of Buddhism and politics, he said, continued to the present time. Comparing GNH to the western conservative, liberal and socialist ideologies, Professor Mancall said that GNH is an ideology, a programme of social and economic change and development. “If GNH is an ideology, the Bhutanese State is and must be the ‘subject,’ the primary actor in the programme of change that we call GNH,” said the Professor. Some papers persuaded on why Bhutan should be cautious in joining WTO and hinted that the unchecked onslaught of globalisation could choke the concept of GNH. Others argued that GNH revived the forgotten element of Adam Smith school of thought, ‘compassion’ as an intricate element of market economy. Still others said that happiness is primarily subjective and usually confined to an individual. People who attended the seminar found the presentations and discussions exciting and enriching. “It was a very rewarding experience, the papers were all well researched and the presenters gave fresh ideas about specific concept and indicators of happiness,” said Yeshey Lhendup, a civil servant with the National Assembly. An IT expert working with Sherubtse college thought that discussions often revolved on abstract orbits. “The world is a complex tapestry with all colours and what some papers did was painted it just black and white,” said Graeme Foster. His Highness the Crown Prince Dasho Khesar Namgyal Wangchuck, who graced the closing of the seminar, said that even if the philosophy of GNH is inherently Bhutanese, its ideas may have a positive relevance to any nation, community or peoples. Organised by the centre for Bhutan studies (CBS) the seminar was assisted by the sustainable development secretariat, Bhutan programme office of save the children federation (USA), the UNDP, the world food programme and the Nike foundation.